Valerie H. Marshall: SDC61: Alter It! 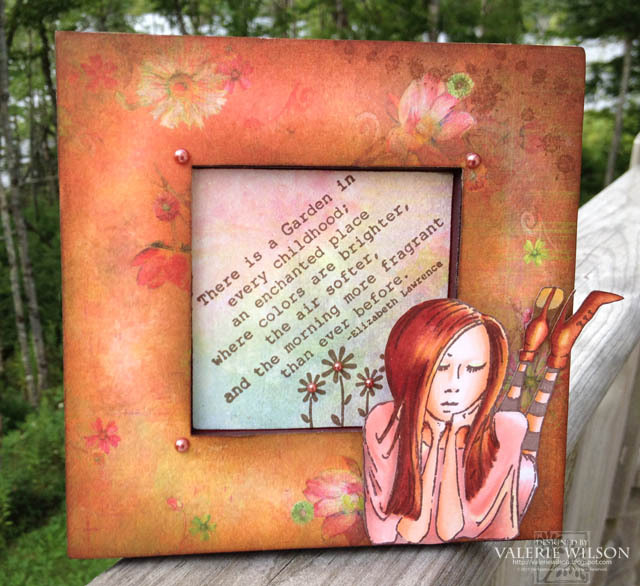 Isn't it awesome having a new Stampotique Designer's Challenge theme every week!? This week, Polly asks us to alter an object for our project. Be sure to play along for your chance to win $30 to spend in the Stampotique Store! I love it when a theme gives me an idea for putting a UFO (unfinished object) in the Done pile! Well, this week, that's exactly what happened. I painted this wood frame ages ago but had never gone back to finish it, so this week, that's exactly what I did! The sentiment is glued to the picture frame insert so it can easily be replaced with an actual photograph. Can you tell that I have made an agreement with myself to start using my Copic markers more often?! LOL! Your frame turned out beautiful. The sentiment is perfect for your UFO!